Silicon Valley is partying like it's 1999, but there's a growing realization the good times can't last forever. Marc Andreessen, an early Facebook (FB) backer, sounded the alarm last week about young tech companies irresponsibly burning cash at unsustainable rates. The venture capitalist predicted many startups will "vaporize" when the market turns south. Andreessen's warning was targeted at startup companies that don't trade on the stock exchange yet, but investors with exposure to tech stocks should not ignore these concerns. If startups begin imploding, the fallout is likely to infect publicly-traded tech companies, especially those that aren't profitable. "A company not very profitable is trading on hopes and dreams. That would damage those hopes and dreams," said Rob Enderle, principal analyst at the Enderle Group. Time to wake up? All of this brings back memories of the dot-com crash of 2000. That meltdown sent the Nasdaq plummeting 75% from record highs, levels it's yet to hit again. Enderle doesn't expect a similar tech plunge today because Andreessen's warning was focused on nonpublic companies. The dot-com bust led countless public companies to go belly up. "Periodically, the market sobers up and makes an assessment of what a company really is. That waking up occurs in cycles. Maybe we're due for something like that," said Roger Kay, president of Endpoint Technologies Associates. A number of tech companies, with varying degrees of maturity, have gone public to much fanfare in recent months. These include red hot GoPro (GPRO), cybersecurity company CyberArk Software (CYBR) and Alibaba (BABA), the largest IPO on record. 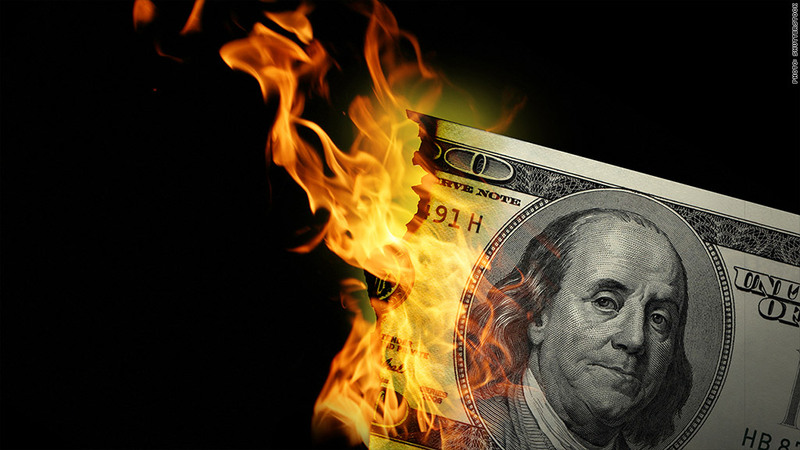 Cash-burning startups to 'vaporize' During boom times, investors tend to overlook the blemishes of a company's business model, young management team and lack of established track record. They focus on the enticing potential to get in early on what could be the next Twitter (TWTR). "Investors typically just assume away the risk because they believe it's the next big thing. They never stop to ask whether or not they even have the possibility of making any money. Pretty soon they're backing dog walking services," said Kay. In rant on Twitter, Andreessen said too many startups are wildly spending cash without thinking about the next rainy day. In the event of a downturn, companies will find it much harder to raise cash or be acquired, he said. "Nobody will want to buy your cash-incinerating startup. There will be no Plan B. VAPORIZE." The tech stocks most at risk in a downturn would similarly be the ones spending lavishly despite a lack of profitability. These companies are likely sporting expensive price-to-earnings ratios that already make them risky. Enough runway for liftoff? Ariel Poler, a Silicon Valley angel investor, said he is also seeing some companies burn through lots of cash with the expectation another round of funding will come easily. "Some of these companies will not be able to raise that cash and will get in trouble," he said. Poler said one consumer business he invested in has a "pretty sizable" burn rate. However, the angel investor isn't worried because the company is on track to break even in less than 18 months and still has over two years of cash in the bank. "The issue is less about the absolute burn rate of $100,000 or $1 million or $10 million per month. It's about: Do you have enough runway to get to profitability?" he said.